Lead poisoning or plumbism can lead to a long list of medical issues, both temporary and long-lasting. A few decades ago, it was a very big problem due to the lead content in certain products and a lack of knowledge and research. Since then, our standards for things like paint has drastically improved. But that doesn’t mean you shouldn’t be aware of lead poisoning and what it can do to you. We’ll examine lead poisoning symptoms, what causes lead poisoning, and how to treat lead poisoning. By the time you are finished reading this article, you will hopefully be well-informed about lead poisoning and its hazards. It seems like such a simple question with such a simple answer, but there’s a chance you may not know all of the details. Lead poisoning occurs when the body accumulates lead over a period of time, which could be over years or can even be over a few months. 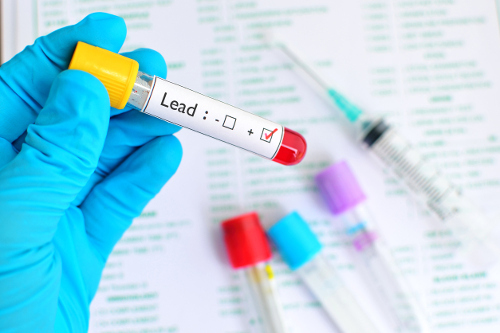 Lead can enter the person’s system via breathing in lead dust, drinking water that goes through lead pipes, prolonged contact with lead paint, and other similar things. The levels of lead do not have to be high as even low levels of lead poisoning can affect a person, especially children. In knowing that, it should be important to know the extent of lead poisoning causes and what to be on the look out for. What exactly are the causes of lead poisoning? The leading cause of lead poisoning is in a word, paint. Old house paint (mainly paint made before 1978 in the Untied States), household items and toys (items painted before 1976 in the United States, but other parts of the world still use lead paint on these things). What makes lead terrible in these circumstances is it’s odorless and tasteless, which means that it can hide fairly well, especially in dust. So, it is extremely important to recognize symptoms of lead poisoning. Spotting the signs of lead poisoning is very important to keep in mind due to what lead poisoning can do to you. One of the things you should understand about lead poisoning is that the symptoms have variations between how it comes out in different age groups, or if the lead exposure is continuous. In children, the symptoms are a bit more pronounced and serious. Since adults are more developed than children, if the lead poisoning is recent, the symptoms will be a little different in terms of their effects. As you can see, these symptoms are terrible for your health and well-being. It is especially so in children as many of those symptoms will go on to affect the rest of their lives, in particular, those symptoms like development delays, learning difficulties, and seizures. At the first signs of lead poisoning symptoms, you should talk to your doctor and seek treatment. Treatment for lead poisoning comes in different steps. The first basic step is to remove the lead that is contaminating you (e.g., get rid of or seal the lead paint, or remove the lead pipes). Of course, this is easier said than done both physically and financially, but it must be done. Regarding treatment for the actual lead poisoning itself, there are a couple of paths you might have to take. Chelation therapy is a medication given orally that binds with the lead so that the lead comes out with urine. It is often suggested for children with a blood level of 45 mcg/dL or more and adults with high blood levels of lead or symptoms of lead poisoning. EDTA chelation therapy is used for adults with lead levels greater than 45 mcg/dL of blood and children who can’t tolerate the conventional chelation therapy drug. Instead, a chemical called calcium disodium ethylenediaminetetraacetic acid (EDTA) is given by injection. Of course, the best lead poisoning treatment is to not get lead poisoning in the first place. There are a couple of ways you can go about preventing lead poisoning. Be careful of painted toys and canned goods from foreign countries. Make sure everyone washes their hands before eating, and make sure to teach your children how to wash their hands after playing. Test your water for lead. If lead levels are high, use a filtering device or drink bottled water until the pipes can be replaced. Use lead-free paint in your home. Avoid areas where lead-based paint may have been used. In addition to these steps, you can get you and your child tested, just in case there are certain things that make you concerned about lead levels. Also, eating a balanced diet can help prevent lead poisoning as it can lead to your system being able to absorb lead at a better rate. Lead poisoning isn’t as big of an issue as it used to be. The changing of restriction laws has reduced the amount of lead paint and pipes currently out in the world, but those items are out there. It’s a good idea to keep in mind the causes and symptoms of lead poisoning. They should be recognized and dealt with as early as possible, so that the damage to you or your children is minimal. Kerkar, P., “Lead Poisoning or Plumbism: Causes, Signs, Symptoms, Treatment, Sources, Prevention, Effects,” ePain Assist, March 3, 2017; https://www.epainassist.com/metabolic-disorders/lead-poisoning-or-plumbism, last accessed May 26, 2017.